The time has come to defend and protect! Eye-popping Star Wars giclee on canvas from artist Mike Kungl. Gallery-wrapped art print measures 18-inches tall x 12-inches wide. Part of the Acme Archives' Gem Collection, this glorious Star Wars Defend and Protect by Mike Kungl Canvas Giclee Gallery-Wrapped Art Print measures 18-inches tall x 12-inches wide. The giclee on canvas comes gallery wrapped around a 1 1/2-inch wooden stretcher bar, ready to hang on your wall or give as a gift. 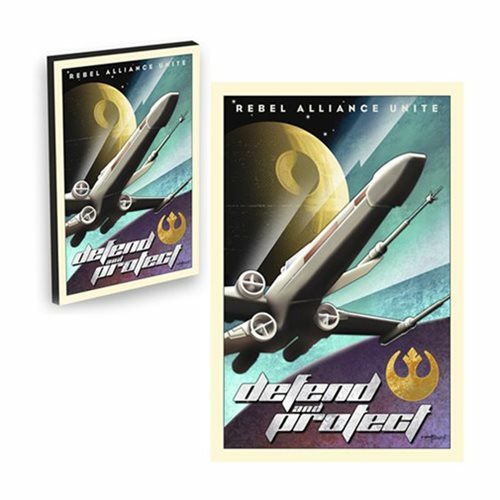 It features an X-Wing fighter, the Death Star, the symbol of the Rebellion, and the words "Rebel Alliance Unite" across the top, with "Defend and Protect" at the bottom. This is a hand-numbered limited edition of just 495 pieces that includes a certificate of authenticity!